Uncertainties for the balance of 2018 imply that stocks could fall sharply or be adequate. As a result, prices may spike or drop into the $50s, depending on what unfolds. President Trump has sway over Saudi Arabia and the other Gulf producers. He can also fine-tune the implementation of sanctions on Iran and waivers to them. I’m expecting he will do whatever he has to, to avert a price spike going into the November mid-term elections. 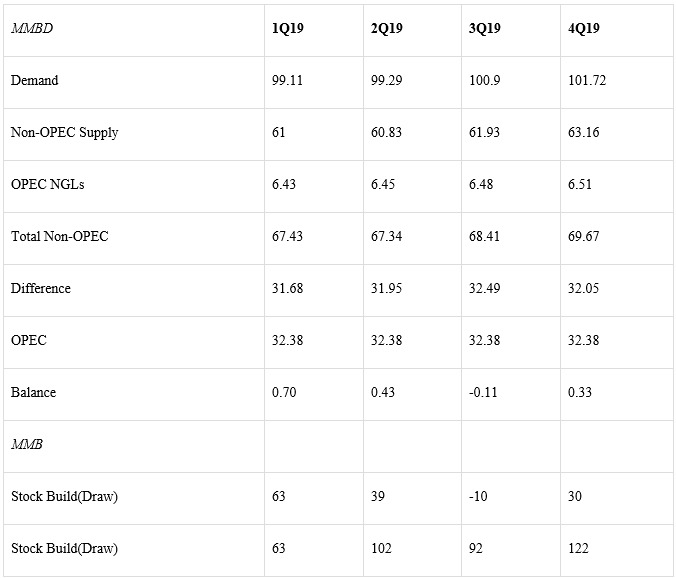 OPEC estimated in its August Monthly Oil Market Report (MOMR) that its crude production in July averaged 32.323 million barrels per day (mmbd). That was about 40,000 b/d higher than in June. The “compliance” level with the 2016 deal dropped to 97%, the first time less than 100% in nearly a year. Saudi Arabia’s production was reduced by about 52,000 b/d, but that was more than offset by gains of 79,000 b/d in Kuwait and 69,000 b/d in the UAE. Iran’s production fell by 56,000 b/d while Venezuela’s output dropped 48,000 b/d. Libya’s output also dropped by 57,000 b/d. 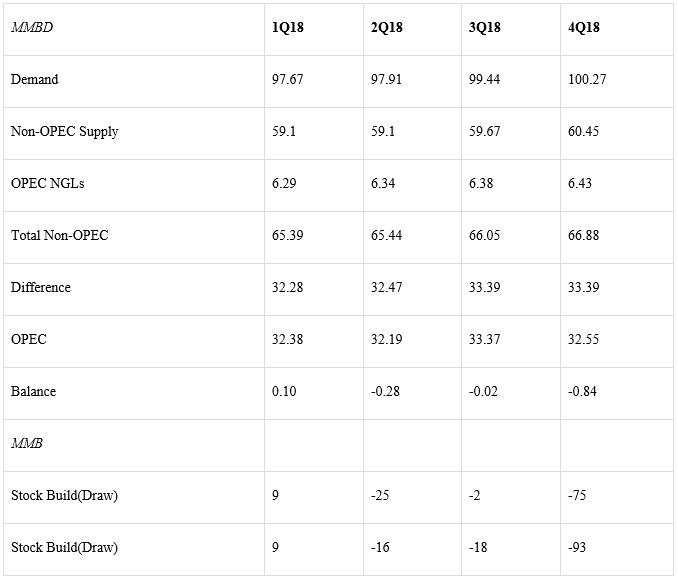 Using OPEC’s own global supply and demand estimates in its MOMR, global inventories would drop sharply in the third and fourth quarters of 2018 unless OPEC’s production increases. 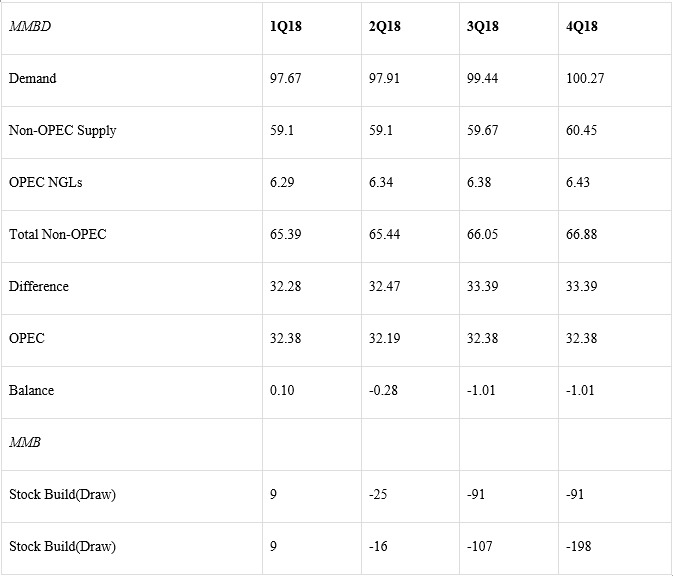 Specifically, assuming no change to July’s output, stocks would drop by 91 million barrels (mmb) in each of the 3Q18 and 4Q18. But there is little reason to believe OPEC’s production will remain in a steady state, given the expectation for sanctions being imposed on Iran, the erosion in Venezuela’s output, and the promise by Saudi Arabia and other Gulf producers that they will increase output. Under that scenario, stocks would drop by 2 mmb in 3Q18 and by 75 mmb in 4Q18. Of course, there is great uncertainty about what production level OPEC will achieve. President Trump also has flexibility in providing waivers to countries that want to buy Iranian crude, which could result in an increase or a decrease in Iranian production. The Strategic Petroleum Reserve may also be tapped to increase U.S. inventories, and in turn, global stocks. 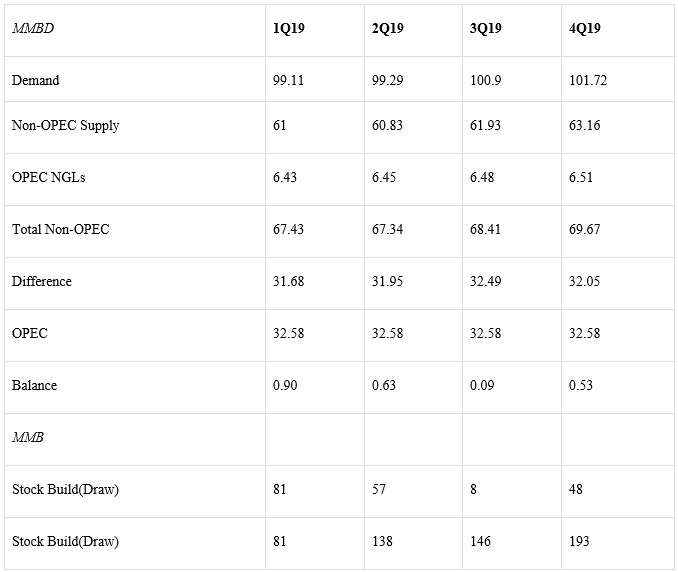 Given OPEC’s supply/demand estimates for 2019 in its MOMR, a steady 32.323 mmbd would be more than adequate. For all of 2019, stocks would rise by 122 mmb. 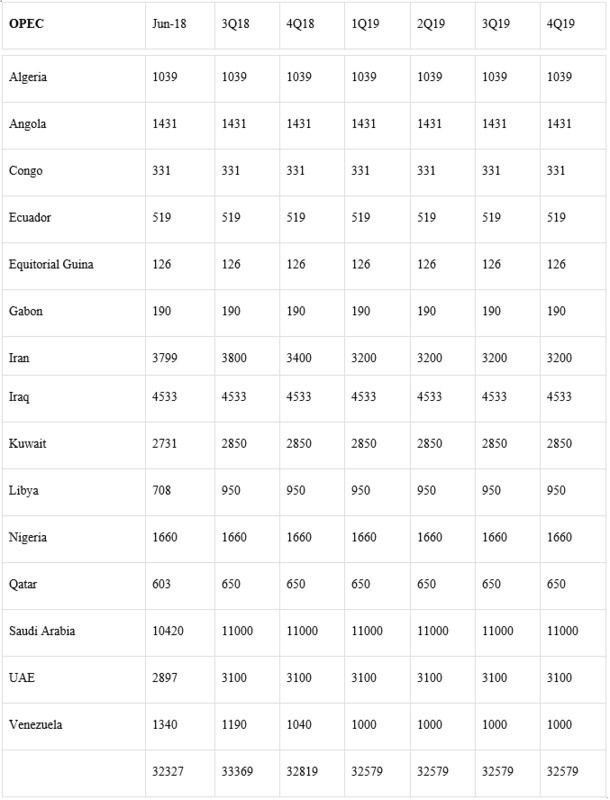 Using my scenario (above), where OPEC production averages 32.579 mmbd, global stocks would build by 193 mmb. Of course, Saudi Arabia would reduce its production to prevent such a scenario from unfolding. OPEC production over the next six months is highly uncertain, creating the riskiest market conditions in many years. Stocks could draw quickly or be adequate, depending on how a number of conditions unfold. I expect President Trump will tweak the variables he can influence to keep prices under control, thus averting a price spike. On the other hand, I expect the Gulf producers, primarily Saudi Arabia, throttle back its increase to prevent a sharp price drop. 2019 is shaping up to be an interesting year with lower expectations for a price spike. If sanctions on Iran are somehow averted, OPEC+ may again be forced to extend the production deal.